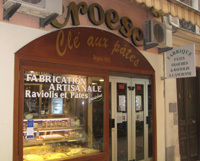 Are you going to Nice (France) and like to Eat? "The Culinary Scene in Nice has changed dramatically over the past couple of years in Nice"
I go to Nice several times a year primarily returning for the great food there. Although I reside in NYC and frequent several of the markets weekly, there is something about Nice that continually draws me... pizza, fresh fish and game... and of course some of the best restaurant deals to be found. Safari on the Cours Saleya makes a great Pizza Provencal in their wood oven. Of course I have noticed a difference depending who is working the ovens, but still you can be sure of a wonderful pizza. In part what makes it so special is the wood that is used; the cheese (Cantal) and ham are both French. A parsley sauce adds to the dish. Make sure to top it with their hot oil made with local hot peppers and herbs. If you decide on Safari during high season be sure to make a reservation. You can do it by phone or simply walk by before the restaurant opens to reserve a table. Safari's signature pizza is the pizza Provencale which is made with French Cheese instead of Mozzarella and also contains ham and parsley sauce. Chantecler has what I consider one of the best lunch deals any where The menu changes every two weeks, and I recommend if possible you have the menu the beginning of the first week when ingredients may be at their peak. The menu changes every two weeks and only two choices per course are available. The menu is usually designed to please most, but there are variances... I have never had a bad menu, but I have had some really memorable ones. So, this place is worth visiting. The service for lunch I have found to be better than most of the 3 star Michelins in France -- it runs like clock work. And, don't confuse Chantecler with the Bistro Rotunda also located in the Negresco Hotel. 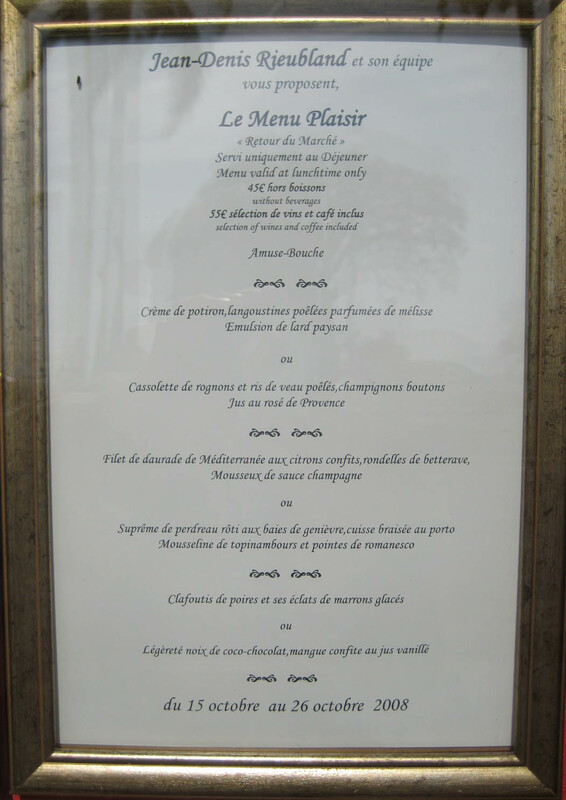 Click for full size image The menu including amuse bouche, appetizer, entre, dessert, coffee and petit fours runs 45 euros, with wine 55 euros. Be sure to choose the menu with wine. Although most places offer only a glass per course, you will find that the wines are not only well selected by the sommelier at Chantecler, but are generously poured throughout the meal. NOTE; Chantecler no longer serves lunch. If you have a big meal for lunch consider cooking a light dinner in. There are several places that sell freshly made pasta. You can also go with a simple Buffalo Mozzarella and tomato salad... Look for some nice heirloom tomatoes at the Saturday market (Note: most tomatoes at the Nice market no longer have that real tomato taste). Try the freshly made buffalo mozzarella at Esquis D'Italia located at 12 Bd. Jean Jaures. They also have an extensive selection of Italian Cheese and Charcuterie. 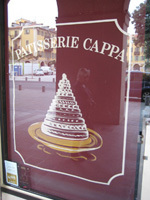 Nice has several excellent pastry shops: Cappa, Espuno, Canet and now Lenotre. My favorite still remains Cappa which is located at 7 Place Garibaldi.